On a gray Sat­urday afternoon in Feb­ruary, the Proctors’ home was just messy enough to be per­fectly com­fortable. It was warm, the windows fogging up against the chill winter air. Carie Proctor, wearing a baseball cap and sweat­shirt, from under which peeked a large, bedazzled belt buckle, moved deftly about the small kitchen, chopping, sprin­kling, stirring, and occa­sionally tasting what looked like a meat lover’s par­adise. The Proctors’ 11-year-old son, Strand, sat on the couch, indif­fer­ently watching Sat­urday morning car­toons while fid­dling with a craft. Earl Proctor came in from the cold, careful to take off his shoes at the door. His gray sweat­shirt, workingman’s jeans, and heavy wool gloves indi­cated a brief sojourn from weekend yard work, perhaps shov­eling snow. Taking off his gloves, he leaned on the coun­tertop and watched his wife sail from stove to spice cabinet, and back again. The scene savored of a typical working class family, engrossed in household chores, happy to be in each other’s company. Except the Proctors aren’t typical. 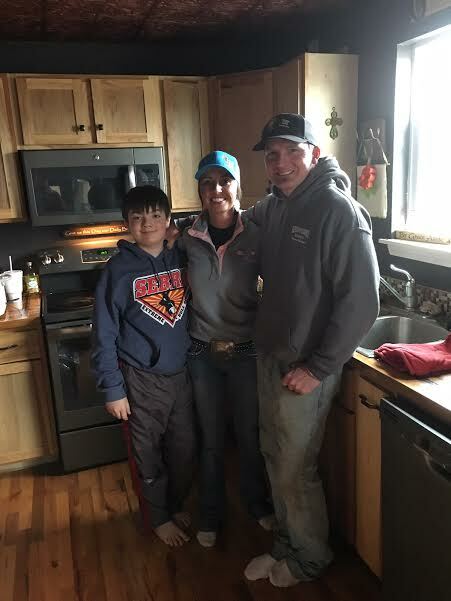 Carie was not only cooking for her husband and son, but also for the 25 hungry cowboys who would descend upon their property within the next five hours. Earl was not coming in to warm up from shov­eling, he was coming in to rest after wran­gling 30 bulls into their respective pens. And most important, Strand was not merely crafting, but was, in fact, a self-pro­claimed “sur­vivalist” whit­tling a spear to do battle with an enemy snapping turtle that had over­taken his creek. The Proctors live above the ProEdge Arena Rodeo in Osseo, Michigan, which houses 30 bulls. A peek through their kitchen windows reveals a bullring in star­tling prox­imity to their front step, and a glance up reveals, not the light of the sun, but fierce flu­o­res­cents illu­mi­nating the deserted bat­tle­ground below. Every Sat­urday night the pack of cowboys buck, rock and coun­ter­balance in an attempt to stay atop their bull for the eight full seconds required to qualify. However, ProEdge Arena’s weekly shows feature not just a physical battle but also a spir­itual one. In between the eight second rides, and some­times during, announcers praise the Lord Jesus, thank him for his pro­tection, and glorify his name. The Proctors’ rodeo is, in fact, a min­istry. Both Carie and Earl grew up on small farms within 15 minutes of each other, but it was a rodeo in Har­rison that first brought them together. Earl was a bull rider, and Carie a barrel racer. Their romance started the from the moment a 12-year-old Earl saw 15-year-old Carie. Carie con­firmed the sen­timent, but even­tually gave in when Earl, at fifteen, could no longer hide his feelings, and bravely con­fessed his enduring love for this rodeo princess. She agreed to give him a chance. “Obvi­ously, I was a mature 12-year-old,” Earl said with a laugh. The Proctors’ initial vision for the arena was a “giant party.” Earl and Carie planned to contact local alcohol vendors, and create a boozy beer-fest-meets-bulls envi­ronment for his riders and cus­tomers. Around this same time, the Carie got pregnant with their son, Strand, and decided that they wanted to raise him to be Christian, as both were raised cul­turally Christian. “I went to vacation bible school because they had really good snacks,” Carie said. But now that the stakes had been raised, and they were respon­sible for more than their own souls, they intended to gen­uinely pursue Chris­tianity. The Proctors afterward felt it was their duty to share their light with others. Today, the couple runs ProEdge as a min­istry. The show begins and ends with a prayer and a tes­timony, and main­tains spir­itual vivacity throughout with christian rock, inter­rupted only occa­sionally by Nelly’s “Here Comes the Boom” when a par­tic­u­larly feisty bull makes an appearance. Peering into the prep area for the con­tes­tants reveals a great many bowed heads and laced fingers as the cowboys prepare to embark on a battle with their leviathans. Just a few weeks ago, one of their regular riders got bap­tized. And at least once a week the Proctors receive some kind of tes­timony about one of their riders or sup­porters coming to God with the help of the ProEdge faith com­munity. One ProEdge regular, Neal Born­trager, second in the season standings, hails from Mid­dlebury, Indiana. He picked up bull riding much like many of his com­pa­triots. He wit­nessed bull riding for the first time at a county fair, and from then on, he couldn’t stay away from it, saying he loves the unique atmos­phere Earl and Carie cul­tivate. what in the world is a rodeo min­istry? Why do we need one? What does it have to do with Hillsdale College?